During my blogging hiatus, an online feud erupted between two bloggers that I have been reading for years. It was glorious to watch. My readers probably already know Richard Nikoley from FreeTheAnimal. The other blogger was Karl Denninger, who mostly blogs about finance, but in recent years has also shown an interest in nutrition. Although I rarely read Karl today, he was my go-to financial site leading into the financial crisis of 2008-2009. Their battle started on Twitter over the Potato Diet. Richard is a fan. Karl isn’t. If you missed the battle in February, you can read Richard’s post Why Does Karl Denninger Lie Like That? I would also link to Karl’s post, but like so many of his other posts in the past, he no longer has it available publicly. Although I think Karl is brilliant when it comes to his understanding of interest rates and other topics related to economics, I completely side with Richard on this topic. Richard like myself is pro-potato and pro-carbs. For a summary on how we went from preaching the low carb gospel to eating bags of potatoes, see the post How Low Carb Paleo Can Fool You. But I also understand why Karl feels the way he does. He has had great success (so far) following a low carb diet. I was there. So was Richard. I totally get it. ** If Karl happens to read this post, I want to say you lose tremendous credibility when you take down old posts. Especially posts of a financial nature. Jim Cramer never had this post taken down. I really wish you’d put up your critique of MMT you wrote several years ago. I recall that post being brilliant. Before this post turns into yet another carb battle, I want to tell you why this battle still resonates with me almost a year later. I recall Karl using the phrase “peasant diet”. He meant it as a critique, but it made me smile. I love the term. If you believe the Food Reward theory of obesity has merit – and I absolutely do – then striving for a more peasant-like diet is a brilliant idea. Filling your belly with nutritious, non-processed foods that are also dirt cheap is a great strategy for defending ourselves from an environment of highly flavorful foods designed to get us to overeat. Unlike peasants, we can selectively choose the foods that are higher in nutrition. For example, plain potatoes are better than rice. Although rice keeps much longer and is cheaper, potatoes are more filling and nutritious. So a nutritional peasant would do better with potatoes. Rice is fine but is not a staple for me. I’ll stick to potatoes. Is there anything else that belongs on the list? I wish I could eat more beans, even lentils or green peas. They are so cheap and nutritious. However, unless my portion is small, I get bloating and even gut pain sometimes. I’ve tried soaking – even with baking soda. Pressure cooking. Adding in ginger. Nothing seems to work. If you have an idea, please post a comment. Farro is super yummy. I’m glad VeggiePharm posted that tip. If you try and eat like a poor person in North America today you will spend a lot of money on junk food and probably end up overweight. However, if you eat like a peasant, your belly will be full but your abs will be visible. And you’ll have more money in your pocket. A lot more money. You don’t need to be a peasant at every meal. Dial in what works for you. I’m probably 60-70% peasant today. I eat the foods on the list and then add in more veggies and dairy. Then when I go out to eat I select foods with more flavor. And to those that object to a Peasant Diet on the grounds that it is too boring, my response is why does every meal need to be highly flavorful and entertaining? If you find yourself overweight then your diet has likely been too flavorful and entertaining. Like a credit card balance, you consumed more than you needed and now it is time to tighten your belt. Thanks for the look into what you are eating these days. When I saw the list of foods, I wondered whether cabbage has a spot on the list. A head of plain cabbage yields a lot of volume for the cost and it’s versatile (raw, cooked or fermented), relatively low flavor, and low calorie. It also pairs really well with potatoes. Any room for it on your list. 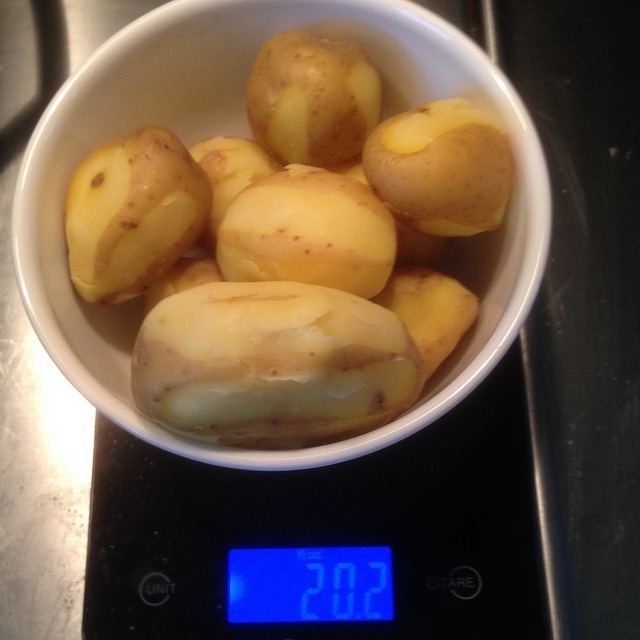 I tried the potato diet but it re-activated my adrenal issues which I have had some success with by eating a higher carb version of Perfect Health Diet. @Geoff – Great idea. I added cabbage to the list. Many times a snack of sauerkraut or kimchi has killed my hunger. @Steve – Agreed. I just added chicken to the list. I found this very inspiring! I made green cabbage “steaks” and oven roasted oil-free steak fries last night. (I did use plenty of seasoning which made it a peasant meal fit for a king ;-). I chopped some of the left-over “steak” and mixed it with my hash browns this morning – delicious! I think your version is healthier. That’s basically the diet of my family, with the exception of 2,3, and 4, whilst also including popcorn a couple nights a week. Also: plantains, as the boys get them fried in butter or coconut oil every morning (after eggs & avocado). When I stopped eating low carb I was eating a ton of potatoes, but in the past year I’ve been having less time to cook and rice because more of a staple, just because it’s faster to cook. I’ve also noticed it’s way easier to overeat rice than potatoes. Eggs, bananas, chicken, tuna, carrots are all staples for me – I do eat more beef than pork, mostly to avoid higher PUFA. Do you think that’s still an issue? @Dinis – Since most of my peasant diet is carbs, I am less concerned about the pork. Also I already did the super low PUFA diet and was able to bring my body temperature up. If my body temp started to drop again, I’d resume a super low PUFA diet, which would likely mean less chicken and pork. I would add organ meat to the list. Dirt cheap and very healthy. Maybe bone broth? @Kris T – Organ meats and broth are cheap and nutritious, but I didn’t include them because I wouldn’t consider them calorie staples. You don’t want to eat too much offal. broth can be a staple, but if has a high cost of time per calorie. I have a pressure cooker, but most people probably don’t. If you’re interested to try some kind of grandmother tips, mine taught me that for a better digestion, it’s good to do a first boil before cooking beans. If you want a technical term, in french it’s called “blanchir” if I remember… It’s not exactly what she was doing, but it’s close. Basically, you would bring the water with the beans to a boil. Then, you throw the water, rince the beans under cold water, and resume your cooking like usual. I never had much problems with beans, so I can’t tell if it really works, but I thought it might be of use to you. @Jeremie – I’m so glad you posted this. This is the method I have been testing in the last 2 weeks and it works the best by far. I’ve used it with lentils and black beans successful. I still soak but I throw out the first boil now. so much better! Are you comparing white rice to white potatoes? Have you considered black rice, red rice, sweet potatoes? Black rice, red rice and sweet potatoes all sound like excellent additions to the diet. I haven’t tried them in the Peasant Diet context, but they are each worth exploring.